The Rise and Fall of Alternative Rock in the Nineties In 1990 alternative music was where it belonged - underground. It left the business of rock stardom to rock stars. But by 1992 alternative rock had spawned a revolution in music and style that transformed youth culture and revived a moribund music industry. Five years later, alternative rock was over, leaving behind a handful of dead heroes, a few dozen masterpieces, and a lot more questions than answers. What, if anything, had the alternative revolution meant? And had it been possible - as so many of its heroes had insisted - for it to be both on MtV and under the radar? Had it used the machinery of corporate rock to destroy corporate rock? 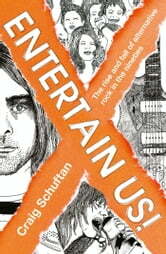 In ENtERtAIN US! Craig Schuftan takes you on a journey through the nineties - from Sonic Youth's 'Kool thing' to Radiohead's 'Kid A', NEVERMIND to ODELAY, Madchester to Nu-Metal, Lollapalooza to Woodstock '99 - narrated in the voices of the decade's most important artists. this is the story of alternative rock - the people who made it, the people who loved it, the industry that bought and sold it, and the culture that grew up in its wake - in the last decade of the twentieth century. Hey, Nietzsche! Leave Them Kids Alone!